With rapid growth over the past few years, Hampstead North Carolina in Pender County is booming with residential development. Pender County Board of Commissioners has approved a sewer line by Pluris Hampstead, LLC that will be built from Scotts Hill to Country Club Drive in Hampstead. With sewer coming, commercial investors and businesses are looking to take advantage of the demand for new developments and shopping centers. Developers mike Pollak and David Greer have began development with partial infrastructure in place, houses are already going up and will be available for purchase in what is now Wyndwater and was the old Topsails Greens Golf Club. Wyndwater will offer new homes by local builders starting in the mid 200's. Just north on Hwy 17 is Cardinal Point is another new development which is in the master plan process and is proposed to offer 250 properties on what is now the site of a mobile home park. The residential boom hitting Hampstead is due to many factors. With the increase and demand in new homes builders are taking advantage of the demand with construction of new homes hitting the market in almost every community that offers vacant build able lots. The Topsail Schools are attracting families from across the country and prices are still affordable with most new homes starting in the 200's. Close proximity to Topsail Island and the abundance of water access communities has been a draw for many buyers. Waterfront properties are becoming harder to find and the deals and prices many seen in 2008-2010 are just not there anymore. Now is the time to buy. Prices in the Hampstead 28443 zip code increased more than any other zip code in southeastern North Carolina and the trend appears to be continuing into 2015. Interest rates are low and the opportunity to find a new affordable home in Hampstead, NC is better than ever. New waterfront home being built in south Hampstead. Only ten minutes to Wilmington and 15 minutes to Topsail Island and Surf City beaches. 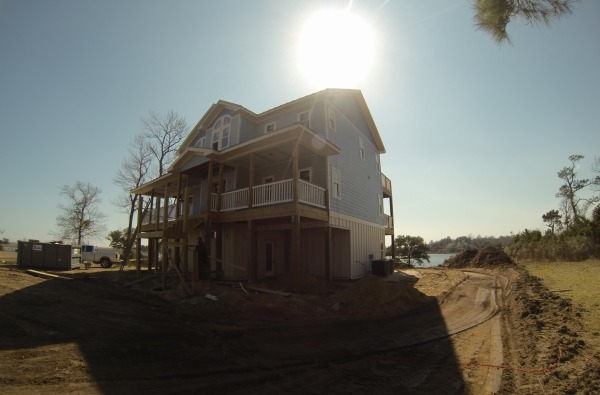 Coastal Realty Associates is available to show property 7 days a week. Contact us today 910.262.6744 we look forward to speaking with you.